‘…it’s been a long time since Gotee has signed a hip-hop/R&B artist. Honestly, I’ve just been waiting for the right person. And I’m really excited to say, we’ve finally found that artist in Aaron Cole. He is extremely gifted, dedicated to his craft and truly passionate about God. Aaron is READY, ready to use his gift of music to light it up in a way that only he can, and the timing is perfect…’ Gotee Records, home to today’s most underrated artists, I reckon. Once a pretty big label that housed artists like Ayiesha Woods, B. Reith, GRITS, Family Force 5, House of Heroes, John Reuben, The Katinas, Out of Eden, Relient K, Sonicflood, Sarah Kelly, Jamie Grace and Stephanie Smith, to name a few (all of which have since departed the label and are now continuing independently or have moved on from the music industry to other projects); Gotee Records currently delivers a small roster of artists, and as of last week (with the introduction of Aaron), presents to the listener a total of 5 artists on the roster- Aaron Cole, Hollyn, Capital Kings, Ryan Stevenson and Finding Favour. While small in artist number, what it makes up for is talent, and a lot of it. All these four artists before Aaron bring to the table a slice of uniquely crafted music- worship/pop (Ryan Stevenson), EDM (Capital Kings), pop/rap/hip-hop (Hollyn) and pop/country/southern gospel (Finding Favour). The rap/hip-hop vein has continued to be focused upon with Aaron’s induction into Gotee Records, and as we hear his debut label single with ‘Right On Time’, a duet with established and prominent CCM artist TobyMac (who is also the CEO and founder of Gotee Records), we as listeners and critics alike are sure to assert that Aaron’s future in music is secure, as this track jumps up the list of my favourite songs of 2017 thus far! 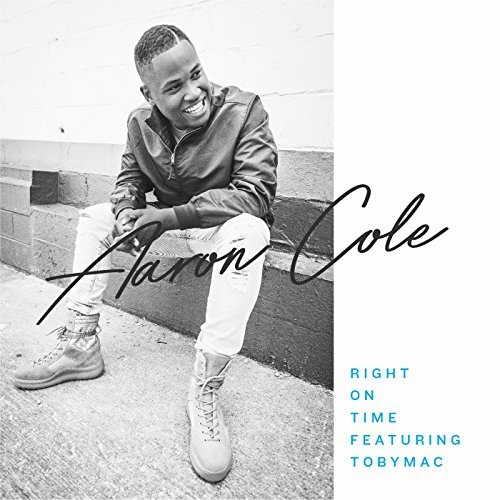 Debuting in the form of a music video last week (and then shortly to iTunes a day or so later), Aaron Cole uses his platform of hip hop and pop to deliver a song that can relate to listeners of music both young and old- because after all, who can’t resist a song, any song, with TobyMac guesting? You know I can’t! Toby appears in this track, and not like in Hollyn’s track ‘Go’ where he and the DiverseCity Band just were there for backing vocals. No, in Aaron’s track, Toby has a bigger presence- delivering a powerful and fitting hip-hop-style second verse. We all know that Toby still has his rap skills, even though they are buried deep within as he moved from rap and hip hop earlier on in his career to now more of a CCM sound. On ‘Right on Time’, both Aaron and Toby break out of the moulds they have been for a while (Aaron was originally known for his rapping skills, in this song he sings and sings quite well, Toby…well, it is a welcomed surprise that Toby was able to break out into rap, and rap well he did!) to create a track that is destined to become a hit on either Air1 or K-Love (or both…hmmm…that’ll be the day when K-Love starts playing Aaron Cole, or anyone remotely of the hip-hop musical vein!). A song that carries a message that reminds us all that God is always right on time, even in the moments when we believe that He is not, either because we are impatient or haven’t really heard from Him properly; I am able to inject myself into this song with such passion and enthusiasm, as ‘Right on Time’ becomes an anthem that we as listeners can declare over our own situations as well, that no matter what we face, we can remember that God is present and that He is always on time in whatever moment or circumstance we want Him to intervene in. ‘…I remember in junior high just enjoying being a regular kid, but I would get picked on because I wasn’t smoking, drinking or getting in trouble. One afternoon I came home and told my dad what was going on and why, and he shared that he thought I was called for a purpose and that this calling would cost me to not be like everyone else. It was that moment that I encountered God for the first time for myself, and I knew I was born to do this and began writing and putting my own songs together…’ With Aaron’s music being a fusion of R&B, pop and hip-hop, ‘Right on Time’ is a glimpse of what is to come for this promising artist on Gotee Records. With his vocal talents already being featured on many artists’ albums, from Hollyn and Canon to DJ Maj and Deraj; we can be quietly excited for whatever Aaron delivers to listeners next, if ‘Right on Time’ is any indication for what type of music he is going for in the future. Well done Aaron for such a catchy song (and a shoe-in, I reckon, for WOW Hits 2019! ), can’t wait for the future and what the Lord has in store in the months to come! I would love you to do a review of “Breaking Thru Light” by Landoman.